Please welcome Lindsay Starck to The Qwillery as part of the 2016 Debut Author Challenge Interviews. Noah's Wife was published on January 26th by G.P Putnam's Sons. Lindsay Starck: Thanks for inviting me to interview! I started writing while studying abroad in Italy during my junior year of college. I was taking a reflective journaling class, and it was the first creative writing I’d done since middle school. I had been planning to apply to law school when I returned to the States, but I found such joy in the writing that I applied to MFA programs instead. Best decision I ever made. LS: A hybrid, I suppose. I start with a broad outline, but it changes through trial and error. I attempted about six or seven different endings of this novel before hitting on the right one. I’d like to think that next time I will plot more… Then, with luck, I won’t need to spend so many years rewriting draft after draft! LS: I am easily overwhelmed by the infinite possibilities available to the writer. A story could go anywhere; a character could do anything. There are so many potential paths to take, and not a one of them is off limits. For me the most challenging part of writing is choosing a course and sticking with it. LS: All kinds of different writers! I admire Marilynne Robinson for her theological, philosophical questions and Daniel Wallace for his imaginative world-building. I love writers who love language, which is why in my day job (as a graduate student) I chose to study early twentieth-century authors like Virginia Woolf, William Faulkner. TQ: Describe Noah's Wife in 140 characters or less. TQ: Tell us something about Noah's Wife that is not found in the book description. LS: Noah’s wife is a photographer. Once I discovered this, it was easier to write about her because I had a better sense of how she saw herself in relation to others. TQ: What inspired you to write Noah's Wife? LS: I’ve always been interested in stories that retell other stories, so I knew that I wanted to rework an ancient text. (For more awesome retellings of myths, see Kate Bernheimer’s anthology XO Orpheus.) I wanted to explore relationships, or different kinds of “pairings.” That led me to Noah, which led me to his wife. What kind of woman, I wondered, would be willing to turn her back on everything she knew to follow her husband into a giant floating zoo? How could she continue to believe in Noah, if she could not see the signs that he saw? If she were given a voice, what would she say? TQ: What sort of research did you do for Noah's Wife? LS: The best kind—animal research! (I had always wanted to become a veterinarian… Perhaps writing about animals is my way of vicariously living out that dream.) I visited the beautiful Asheboro Zoo in central North Carolina, where the director took me around behind the scenes. I read up on real-life zoo floodings such as those that took place in Calgary and in Minot, North Dakota. In one phone conversation, the director of the Roosevelt Park Zoo described to me how the zookeepers evacuated the animals when the waters in the zoo rose too high. He told me that the camels—housed temporarily in a warehouse—figured out how to turn the lights off and on with their tongues! These stories truly brought the animals to life. LS: The easiest character was my town matriarch, Mrs. McGinn, who wound up reminding me of Mrs. Rachel Lynde of Anne of Green Gables. She possesses such a strong personality that I didn’t need to work very hard to get it down on the page. She emerged with great force and conviction, which is how she does everything. The most difficult character to write was Noah’s wife. Her journey over the course of the book is to grow from a minor character into a protagonist—but she prefers to play a supporting role. She likes to surround herself with strong characters because she doesn’t know how to define herself without them. This was troublesome because I couldn’t figure out how to define her without them, either. In early drafts, she was so passive that she simply wasn’t interesting to read about. She grew stronger as I learned more details about her—for instance, that she had a talent with animals that nobody else possessed. TQ: Why have you chosen to include or not chosen to include social issues in Noah's Wife? LS: I like to think that the novel does a certain kind of feminist work by bringing an unnamed “wife” from the margins of the story into its center. I wanted to explore various kinds of relationships and the way that we define ourselves through other people. Historically, women have been far too frequently defined by their husbands, their fathers, their children. In my novel, Noah’s wife’s major struggle is learning how to define herself. TQ: Which question about Noah's Wife do you wish someone would ask? Ask it and answer it! LS: I wish that more people would ask me about the relationship between humans and animals in the novel. When the zoo floods, the townspeople must take the animals into their homes to care for them; but the animals also take care of the townspeople in turn. I wanted to think about the ways in which humans and animals are similar—so there are many moments when my characters are described with animal traits, or moments when they announce to one another how alike or unlike they are to the beasts. TQ: Give us one or two of your favorite non-spoilery quotes from Noah's Wife. LS: “Heroism is all about timing.” That’s Mrs. McGinn speaking to herself, mulling over one of the novel’s core themes: what it means to “save” something—whether it be a relationship, a town, an ideal—from destruction. LS: Oh, another novel, eventually! This novel floated outside of time and space—like a fairy tale, or a parable—and so I’d like to write something grounded a specific geography and era: like the Midwest of the twenty-first century. I’d also like to write something even more suspenseful… Although I suppose that means I’ll really have to step up my “plotting” game. LS: Thank you for hosting me! Lindsay Starck was born in Wisconsin and raised in the Milwaukee Public Library. She went on to earn her B.A. in literature from Yale and her M.F.A. from Notre Dame. 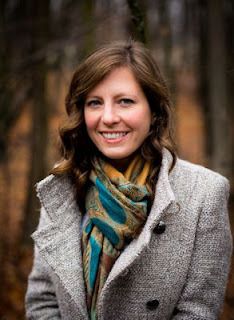 She currently writes and teaches in Chapel Hill, North Carolina, where she lives with her husband and their dog. 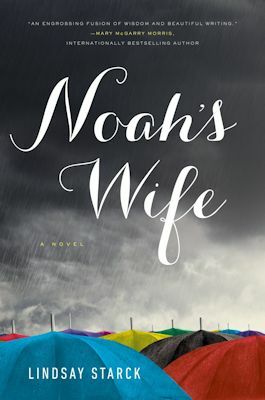 Noah's Wife is her first novel. Noah’s Wife is her first book.